Marketing/Sales/PR Commandment: Know Thy Customer! There is an unwritten commandment to marketing, PR and sales … “know thy customer!” Knowing who the customer is requires a holistic view based upon good research and solid facts to ensure that what you deliver in the way of content, messaging and features meets your customer’s needs. There are many approaches to understanding how customers engage with a brand and ultimately purchase products. One effective approach is the development of Personas. A well-researched and developed persona can make all the difference in meeting quarterly and annual sales, lead and engagement goals. 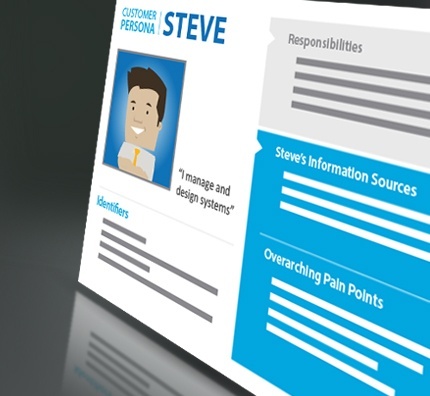 What are Personas and why should I spend the time creating them? Personas provide everything about key customer(s) that marketing and sales need to know to deliver solid content, features and sales strategies. By creating a well-defined persona you can weed out the customer noise and focus on what matters most to those who care about your brand and solutions. Unfortunately, some marketers and sales professionals consider personas to be unnecessary and too general to make a difference. Despite this thinking, taking a good look at the customers that matter most and getting to know their needs, focus and sales process can ultimately change a mediocre campaign into a very profitable one. What should be included in a persona? Size of company they work for? Responsibilities – do they manage people/processes? Where do they prefer to get their information on products? What are their key pain points? What drivers lead them to search for your product? What role do they play in the purchase process? What are the common objectives to their purchasing a product? Investing the right amount of time up front will save money, frustration and even time in the long run. Getting to “know thy customer” requires understanding their demographics, responsibilities, buying habits, purchasing process, information sources and pain points. All provide a strong story that can be told through proper placement of content, resources and messaging. However, all of these steps take time to completely understand what matters most to your customer. Getting the right people involved is also critical to the development of personas. Marketing, PR and field sales team members can help pick the right mix of customers and what challenges or concerns come up during the buying process. In general, refining this list down to 3-4 key personas can have the largest impact on the company’s bottom line. “Know thy customer” requires the right questions, research and team members to ensure that the personas drive leads and sales. I have had the privilege of doing this with a number of companies with great results. Some of you may read this and say – no duh. But if we are honest with ourselves, how much time do we really spend getting to know our customers/readers? I know I still have work to do, but knowing the right questions to ask to the right people in the organization makes the creation of personas easier and more successful. When I have done this the right way, clients programs and lead generation efforts are more successful. It feels amazing to be a part of their success especially when it is done right.